Neudorf's Gingerbread House offers Bed & Breakfast accommodation as well as a brand new self-contained cottage, in the heart of the Nelson - Abel Tasman - Golden Bay region. Neudorf's Gingerbread House offers Bed & Breakfast accommodation as well as a brand new self-contained cottage, in the heart of the Nelson - Abel Tasman - Golden Bay region. Neudorf's Gingerbread House Bed and BreakfastNeudorf is situated in an idyllic valley with golden beaches, fantastic cafes, vineyards, Abel Tasman and Kahurangi National Parks and Nelson City nearby. Take time to explore the Nelson region, New Zealand's sunshine capital. 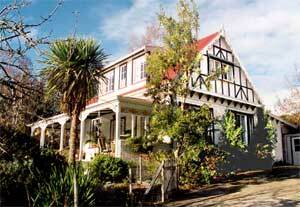 Neudorf's Gingerbread House is an outstandingly charming country accommodation. It's warmth and character make it a very special place. Unwind and relax on the wide veranda with views over gentle rolling hills. Enjoy the colourful organic gardens, the home of flowers, shrubs, trees and native birds. Self contained accommodation in Nelson, New Zealand It will be our pleasure to help you with reservations for the Abel Tasman National Park, or any other bookings. Take advantage of our experience and local knowledge. We look forward to meeting you and offering you country hospitality at its best. Please don't hesitate to contact us for any further information. Neudorf's Gingerbread House offers Bed & Breakfast accommodation as well as a self-contained, eco-friendly cottage, called Casa Lucia - all in the heart of the Nelson - Abel Tasman - Golden Bay region. Neudorf is situated in an idyllic valley with golden beaches, fantastic cafes, vineyards, Abel Tasman and Kahurangi Na-tional Parks and Nelson City nearby. Take time to explore the Nelson Region, New Zealand's sunshine capital. 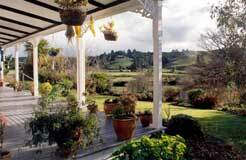 Neudorf's Gingerbread House is an outstandingly charming country accommodation. Its warmth and character makes it a very special place. Unwind and relax on the wide veranda with views over gentle rolling hills. Enjoy the colourful organic gardens, the home of flowers, shrubs, trees and native birds. It will be our pleasure to help you with reservations for the Abel Tasman National Park, or any other excursions in the area. Take advantage of our expe-rience and local knowledge. We look forward to meeting you and offering you country hospitality at its best. "The Gingerbread House - is this real or from a fairytale? How can the Eucalypt flowers be so red? I sit under the plum tree, enchanted, while the cicadas chirp on and on." "One of the nicest places in the world! The Cottage is divine! The care you have put into the design and health of the place really comes across. We are so glad we found you! The simplicity and elegance is perfect! Thank you for the warm welcome." For more information about us and our service,see A little different.